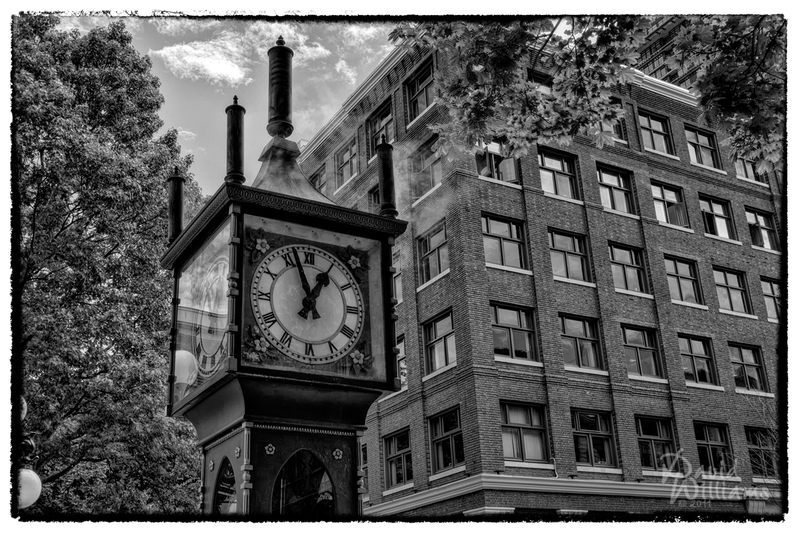 On a recent trip to Vancouver with >>Emily<<, we stopped off in Gastown where they have this cool steam-powered clock. As it turns out, there are very few public steam clocks left. This one was made in 1977 to help bring tourists into Gastown which is a district of Vancouver in the northeastern part of downtown. Great shot David, love the processing. There seems to be an epidemic of crazy business going around lately, must be something in the water. Hopefully things get back to routine for you soon. Cool Pic. Thanks for the comment on my blog 🙂 Posting can be time consuming…..who wants to be indoors during the summer anyway……..at least when your living in the north. That is cool! Nice B&W conversion, and I like the composition with the clock off center.